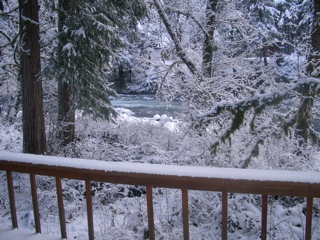 The McKenzie River area offers virtually endless recreation opportunities, in spectacular locations, with rivers, streams, lakes and mountain views. Come and play in the snow nearby. Skiing and snowboarding at Hoodoo Ski bowl just 30 miles away plus many cross country ski trails, and even more places for exploring snowshoeing. Hiking and biking the lower trails all winter, including the McKenzie River Trail starting just a mile from the Caddisfly. The McKenzie River Trail goes from there for 27 miles following the McKenzie River, passing through old-growth forests and by spectacular waterfalls and rapids. Soaking in nearby natural Belknap Hot Springs (or others in the forests). Fishing in the lower river, the lakes and reservoirs year ’round. 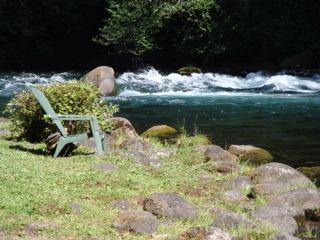 The McKenzie River is one of the most productive trout streams in Western Oregon. Sightseeing: Explore the beauty of the region in winter, with the incredible scenic views. Wander around the Western-style town of Sisters about an hour away. There’s even several covered bridges in the area. Nearby restaurants such as the McKenzie General Store – Obsidian Grill, McKenzie Station Pub and Espresso, and Takoda’s. There is also unique shopping with Christmas Treasures. Rest and Relax in a beautiful setting, listening to the roar of the rapids, smelling the fresh air, looking out at the River and the surrounding trees.. Fishing in the beautiful McKenzie and nearby lakes and reservoirs for rainbow and cutthroat trout, summer steelhead and even spring chinook salmon. Fish from the bank or drift the river in a drift boat. Golf at the famous Tokatee Golf Club just 2 miles away – one of the highest rated public golf courses in the country. Deer and elk hunting in season. Enjoy beautiful autumn foliage: the golds and reds of the vine maple, the big leaf maple and other trees. Then in spring, see the wild rhododendrons and all sorts of wildflowers. 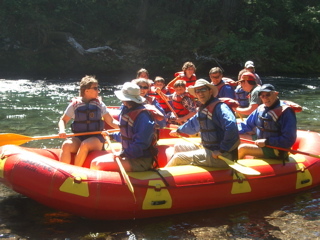 White-water rafting (High Country Expeditions, Oregon Whitewater Adventures or Horse Creek Lodging and Outfitters) on the river and canoeing on the lakes and reservoirs. Sightseeing: Visit nearby lava beds at the base of the Three Sisters Mountains, waterfalls such as Sahalie, Koosah and Proxy Falls, lakes, mountain vistas (including seven major volcanic peaks in the area), and so on. Boating: Float on crystal clear water at Clear Lake (boats are available for hire). Biking: Many trails are good for mountain biking, including the 27-mile McKenzie River Trail. We can provide information on guided fishing or rafting trips, golf packages, biking packages and ski resorts.